Leadership and management are distinct concepts but the words are often used as though they have the same meaning. 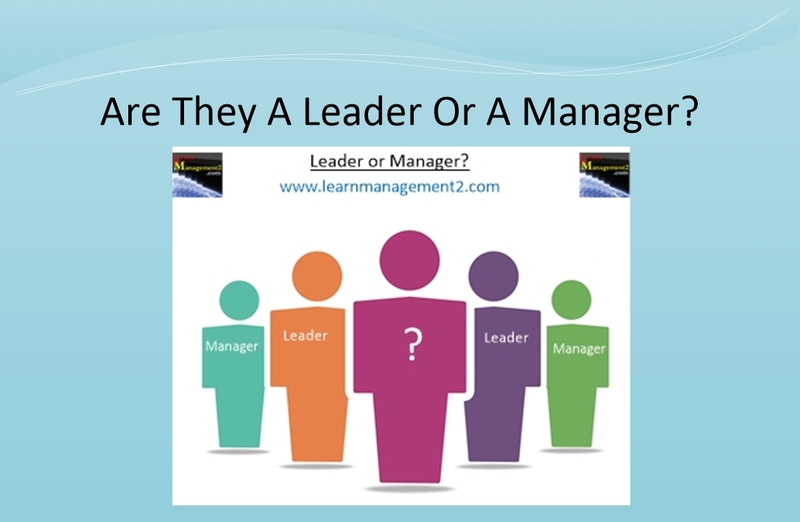 This confusion may arise from the fact that sometimes the same person is employed to do the job of leader and manager. A leader's job is to decide where the team they are leading is heading. A leader will set the ultimate aim, objective and goals for the team. They will then inspire and motivate the team to achieve the objectives set. This will involve reviewing progress and ensure that the team is on course to achieve the objectives set. The president of a country is a good example of a leadership role. A manager's job is to set how the team will achieve the objectives set by the leader. They will overcome any problems the team encounter and decide how to deal with complexity. A football manager is a good example of a manager. All Football managers have the same objective i.e. to make sure their teams win and all of them need to work out how this will happen. Football managers are not leaders they do not set objectives. The objectives for football clubs are set by the club's owners and directors. A simple way of illustrating the difference between leader and manager is to use the example of a team who are set the goal of building a path from point A to point B. Set the goal of building a path. Decide that the path will go from A to B.
Inspire and motivate the team so that they want to build a path for their leader. Review progress as the path is built and ensure that the team are building the path from A to B. Plan the project and decide things such as budgets, pay and materials used. Implement plans and control building of the path. Organise the team and delegate tasks to them. Overcome any problems e.g. trees blocking the route where the path is to be built. Another way of differentiating a leader from a manager is to think of someone known as a world leader for example Martin Luther King and think about what they did. You will discover that each of these leaders are great visionaries, and are able to inspire and motivate their audience. They will present their ideas and dreams to the world in a way that they feel appeals to the audience. They will give them an overview of the vision and will not set the small details of how their vision will be achieved. Instead the small details will be decided by other people. Other people will plan and manage the work needed to achieve the leader's vision. The leader's job is to continue motivating and ensuring that project is on course to achieve its objectives.